It has been 64 years since President Harry S. Truman pulled the upset victory of the 20th century, and historians still can't get enough of it. Now comes a new volume brimming with fresh and detailed information. 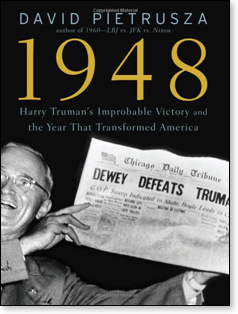 "1948: Harry Truman's Improbable Victory and the Year That Transformed America's Role in the World" contains more human interest subplots than a Shakespeare play. It reads like a movie thriller waiting to be filmed, assuming a producer could be found who will not spin David Pietrusza's objective and well-researched volume to fit Hollywood's ideological predilections. Historians would be strained to identify any presidential campaign under this nation's 225-year old Constitution that arrived at a greater surprise ending than the four-way race of 1948. The result left pollsters, pundits, and the campaigns in a state of shock. Only Truman had appeared confident. His Republican opponent was Thomas E. Dewey — Governor of New York. Dewey was smart and a proven crime-buster, but also possessed of "unbridled arrogance." 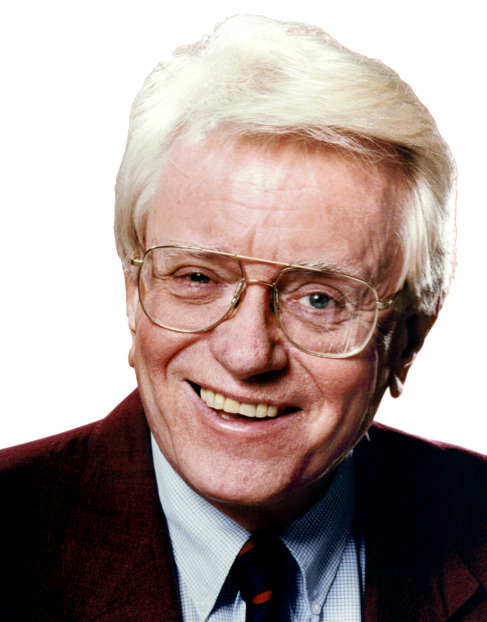 He was credited (by a detractor) with an ability "to strut while sitting down." 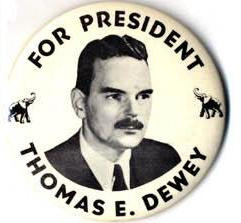 Dewey's candidacy was officially decided at a contentious Republican National Convention in Philadelphia. As his support increased in the first two ballots, the non-delegate guests in the gallery (as witnessed by this writer) repeatedly ignored the chairman's plea not to participate in a voice vote against a "recess" proposed by the New Yorker's opposition. Dewey backers perceived that measure as an attempt to torpedo the New Yorker's nomination in "smoke-filled room." 1948's plot thickened when domestic communists, formerly part of a "United Front" with Franklin Roosevelt's New Deal, took effective control of a third party whose candidate was Henry Wallace, whom Truman had fired from the cabinet for his pro-Soviet statements. Truman's administration itself was bedeviled by an investigation of New Deal official Alger Hiss, an accused Soviet spy who ultimately went to prison. Meanwhile, the post-Civil War "Solid [Democrat] South" began what would be its decades-long conversion to the GOP. The 1948 campaign plot further thickened when Southern delegates bolted the Democratic National Convention over the "civil rights" issue. South Carolina Governor Strom Thurmond became their "Dixiecrat" presidential candidate. With the old Roosevelt coalition splitting the Democratic Party three ways, the conventional wisdom was that Harry Truman was doomed. Governor Dewey was advised to talk in platitudes because the election was "in the bag." His lackadaisical pace resulted in 101 fewer speeches than were made by "underdog" Truman, whose "Give 'em hell" barn-storming was smilingly described by the president himself (in private) as "demagoguery!" — Though touting his civil rights program, Truman had confided to his diary some extremely disparaging insults to minorities, including the "n" word. — The president, more than a half-century removed from Barack Obama, played the class warfare card while privately having derided liberals as "the lowest form of politician." 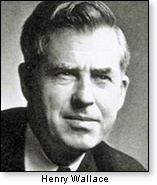 — A communist whose writings boosted Henry Wallace would later mentor a young Obama. — A Capitol Hill love triangle destroyed the Republican chairman of the House committee that exposed the Hiss case. — General Dwight Eisenhower, then lobbied by Democrats to replace Truman on their ticket, proposed to fight inflation by imposing a two or three year 100% corporate profits tax (an idea he walked back after the inevitable uproar). — Senator Arthur Vandenberg, respected GOP chairman of the Senate Foreign Relations committee, was denied the presidential nomination after certain facets of his "private life" came to light. — Just as Strom Thurmond's "Dixiecrat" campaign was taking off, the young mother of his biracial child was dying (unknown to him) in a New York poverty ward. During the Wallace convention, reporters grilled that candidate about embarrassing letters he had exchanged with a Russian mystic. Pietrusza vividly describes the rapid-fire cross-examination showered on the Iowan by columnists Westbrook Pegler (who had exposed the letters) and H.L. Mencken, two of the most colorfully aggressive scribes of their time. The author then recalls that the Republicans had known of those letters eight years earlier when Wallace was the Democratic candidate for Vice President. However, they were dissuaded from raising the issue then because the Democrats would have retaliated by exposing an adulterous affair involving the married GOP presidential candidate Wendell Willkie and a divorcee who worked for the New York Herald Tribune. The tone-deaf Dewey campaign even failed to exploit the "worst mistake" of the Truman campaign: the president's attempt to use the sitting Supreme Court Chief Justice to confer with Joseph Stalin on control of the atom bomb. That was almost a year before the Soviets exploded their own A-bomb. "1948" is scholarly history, entertaining drama, and a just a fun read, and not only for political junkies.